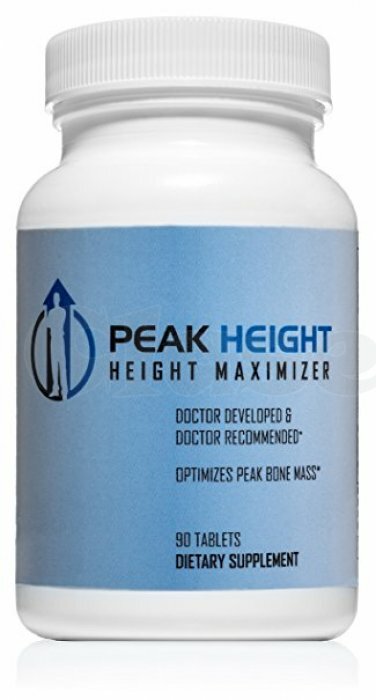 Peak Height is a Doctor designed nutritional supplement to increase height. It contains optimal amounts of nutrients that have been scientifically proven to increase height. 1. Bone lengthening and growing taller occurs at the growth plate in your bones. 2. Growth plates are only open during childhood & teenage years. 4. Your bones need specific amounts of vitamins, minerals, protein, & growth factors to grow to their maximum length (making you taller). 5. Peak Height provides your nutrient hungry bones with optimal amounts of many nutrients to enhance their growth. Recommended starting dose is 6-12 months. Taking Peak Height for a longer period of time increases your growth potential. For maximum height increase take Peak Height pills over the length of your adolescent growing years, ages 11-22. Take three height pills in the evening with food. Peak Height contains vitamins, minerals, & amino acids found in everyday foods. The amount of each ingredient in Peak Height is well below the upper daily intake level published by the National Institute of Health. Please visit their website NIH for further information. Peak Height does NOT contain any stimulants, HGH, or steroids. As with any nutritional supplement, you should consult your doctor before starting. We recommend taking Peak Height with meals to prevent any possible upset stomach as with any vitamin.